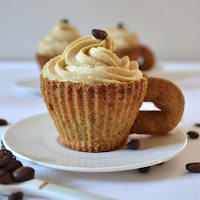 Today I want to share the idea of creating an edible coffee cup which has been around bloggers' pages ever since Lavazza announced that they made a prototype. I don't know whether someone, somewhere is enjoying their coffee cup right now, but I haven't seen them around yet. When the news came out, although I thought that the idea of a "cup made of pastry covered with a special icing sugar, which works as an insulator, and makes the cup waterproof hence allowing you to use the cup and then appreciate its taste, so to eat and drink coffee along with a biscuit at the same time" (their own description of the product),was absolutely brilliant and beautifully made, I wondered how long it took for it to start crumbling, and the dilemma of people who don't take sugar in their coffees. I'm sure that if they haven't done so already, they'd have no trouble coming up with a solution without my valuable input. It all happened last year - and was soon forgotten - until a few weeks ago when I accidentally came across a page that reminded me of the idea. It was the first home made version of cookie cups that I liked enough to try myself. Before I proceed, let's make it clear that we are not talking about a cup that holds coffee; that we leave to the professionals. Instead, we use coffee cream. I have had these silicone cup moulds for some time now and haven't yet had a chance to test them. They have been widely used for baking cupcakes, which I don't make very often. So, when I read the recipe, my little cups were an obvious choice. The link to the original recipe is given above. I made a few adjustments to suit our delicate pallets better. Whichever recipe you choose, rest assured that it will not be a one-off bake. Lightly dry-roast the pecans and let them cool. Grind to fine crumbs in a food processor or spice grinder. Mix with the rest of the dry ingredients; add butter, then egg yolks and vanilla extract. Make a smooth dough, wrap it up and refrigerate for an hour. Take it out, let the dough rest at room temperature for a few minutes, weight it and then divide into portions. The silicone cups I used take about 50 gr of the dough and each handles roughly 8-10 g. Using your fingers, press the dough to shape against the inside walls of your mould. You don't have to make coffee cups, use silicone cupcake or small pie moulds. Freeze overnight and bake from frozen. Preheat the oven to 180 C/350 F/ gas mark 4, line the moulds with baking paper, fill with beans and bake blind for 15 to 20 minutes, depending on the size of your mould and the thickness of the dough. Peel the paper and take the beans out. Bake for a further 5 to 10 minutes on 150 C/300F/ gas mark 2. Mould "reversed C" handles and bake for 15 minutes. Let everything cool at room temperature. To make the cream, bring to boil 250 ml of double cream. Beat the egg yolk with sugar and cornstarch, then add to hot cream. Cook until thick, add dissolved coffee and a spoon of dissolved gelatine if necessary. Let it cool completely. Mix the rest of the cream, combine with cold coffee cream, then fold in the mascarpone cheese. Spoon the cream into a piping bag and leave to refrigerate for a couple of hours. Assemble the cups by "gluing" the handles with melted chocolate and leave to harden. Finally, pipe the cream and take a bite.